The essential facts about the nature of the hydrogen embrittlement of steels have now been known for 140 years. It is diffusible hydrogen that is harmful to the toughness of iron. It follows, therefore, that the harmful influence of diffusible hydrogen can be mitigated by preventing its entry into steel or by rendering it immobile once it penetrates the material. 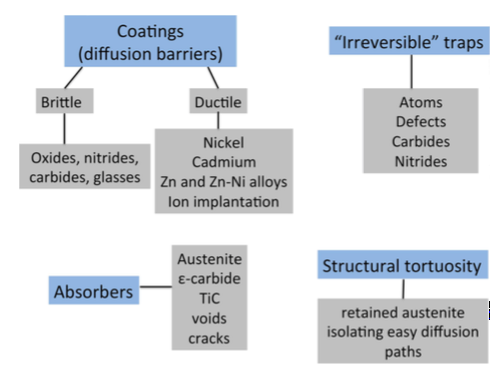 This review deals with the methods that might be implemented to design steels and components that resist hydrogen embrittlement by reducing the intake of hydrogen or rendering it innocuous when it does penetrate the steel. ISIJ International 56 (2016) 24-36.